Cianbro Corp. chairman and CEO Peter Vigue with a map backdrop of the proposed east-west highway. AUGUSTA, Maine — Areas for agreement between the three major candidates for governor will likely be few and far between, but here is one: Neither Republican Gov. Paul LePage, Democrat Mike Michaud or independent Eliot Cutler is sold on the proposal to build a private east-west highway. There’s just not enough information available — about the route, the potential environmental impacts or direct and indirect public costs — to say one way or the other, their campaigns say. 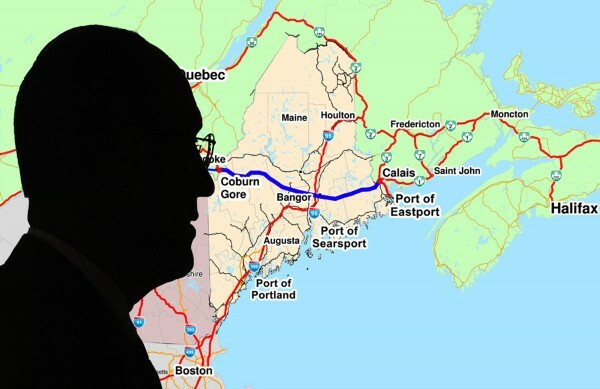 The private highway, proposed by Cianbro Corp. and championed by the company’s leader, Peter Vigue, would bisect Maine from Calais to Coburn Gore, connecting Canada’s Maritime Provinces with Quebec. Vigue spent much of 2012 and 2013 pitching the plan to political leaders at the municipal, county and state level, but opposition came swiftly. Currently, trucks carrying goods from the Maritime Provinces must drive south through Maine and southern New Hampshire before they connect with highways that travel to Montreal, Quebec City or the Midwest. Vigue says the proposed 220-mile highway, estimated to cost up to $2 billion, would help Maine take advantage of its location by improving connectivity of eastern Canada and the interior United States with Atlantic trade routes to Europe and Asia. New developments in the planning of a proposed east-west highway are few and far between, but activists opposed to the project continue to push towns and cities to pass ordinances and moratoriums to stymie the developer. Activists say the highway would endanger local ecosystems, divide communities and cause drivers to bypass the small communities served by local roads. Just this week, Dexter extended a moratorium on the highway until at least next year. Sangerville has also passed an anti-highway ordinance, and residents in Charleston say they’ll continue efforts to pass similar rules, despite recent setbacks. The three gubernatorial candidates fall along a spectrum that ranges from agnostic to skeptical. “We do not know where the east-west highway would go, whether it is feasible or what its costs would be. Until those unknowns are addressed and put forth in a concrete proposal, a governor cannot weigh in,” LePage said. Cutler, who worked on many infrastructure projects during his time as an environmental attorney, said it was impossible to judge the east-west highway proposal before any environmental impact study is conducted. “The reason I’m neither for or against it is, I think, like most people in Maine, I don’t know enough about it,” Cutler said recently. LePage and Cutler may both be noncommittal on the east-west highway proposal because of a lack of specific information, but both previously have given support to a plan to facilitate more trade infrastructure between the Maritimes, Maine and interior North America. At a “Leaders Roundtable” in Bangor four years ago, Cutler said he would need to see Canada put some skin in the game. LePage said he thought an east-west transportation route was necessary and attainable. “We should have been doing these things 20 years ago,” he said. Michaud came closest to having a firm position against the project. He previously supported the idea of a public highway from Calais to Watertown, New York, and said he wasn’t opposed to the idea of a private highway on principle. However, he said he didn’t think Cianbro could possibly acquire the necessary land without asking the state to use its eminent domain authority, which Michaud said he would oppose. Vigue has said he will not seek to use eminent domain. Still, Michaud said he was skeptical. Michaud, who represents the congressional district in which the highway is proposed, said he believed Maine should be revitalizing and improving its existing rail structure instead of working toward a truck-centered highway. With the right investments, existing rail lines could carry goods and passengers through Maine along roughly the same route as Vigue’s proposed highway. The state Legislature originally approved a bill to spend $300,000 of state funding to study Cianbro’s east-west highway proposal. As public opposition to the plan grew, the bill was repealed and funding for the study was clawed back. Project manager at Cianbro Darryl Brown said the company has been focused on other endeavors — such as its partnership with the University of Maine to create a pilot floating wind turbine, Maine Aqua Ventus — but said planning and conversation for the highway are ongoing.